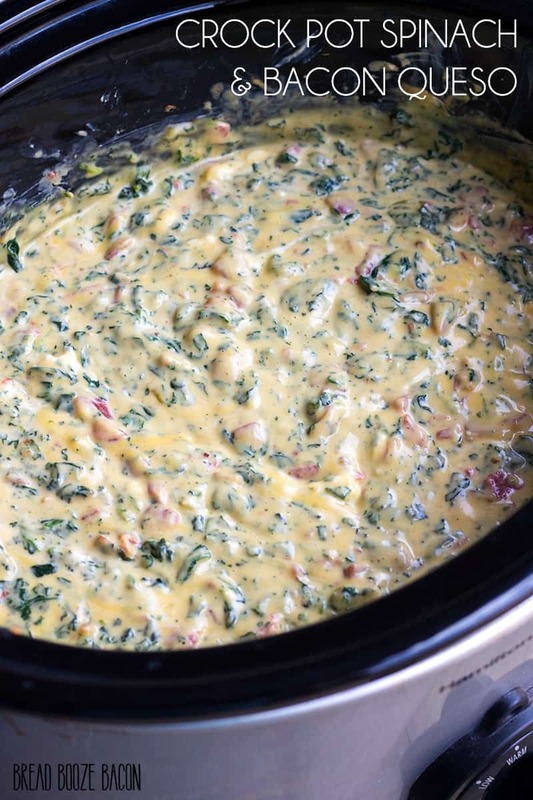 You’ll never need another cheese dip recipe again after you try one bite of Crock Pot Spinach & Bacon Queso Dip! There’s nothing like really great appetizer dip recipes! They are my favorite party bite. My favorite dips are ones you can make ahead of time or throw in the crock pot so it’s one less thing to worry about cooking at the last minute. This Crock Pot Spinach & Bacon Queso Dip is one of my most requested dips when we’re having friends over. It’s especially great when there’s a football game on and when we end up grazing all day instead of eating a real meal. 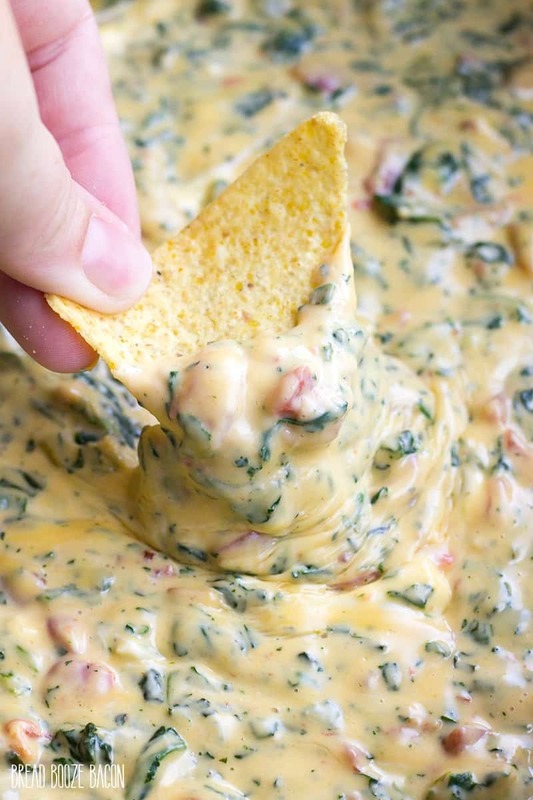 This dip is SUPER easy to make. The only prep work is cutting up the cheese and cooking the bacon. I don’t always like to babysit my bacon while cooking it in the skillet, so I bake it in the oven at 375 for 15 minutes and it comes out perfect every time. I don’t like my queso too spicy so I use the tomatoes with mild chiles, but if you like some heat you can use the hot version or even add a diced jalapeno (seeds optional for extra heat). Then use let this dip do its thing in the slow cooker. Give it a really good stir and serve. 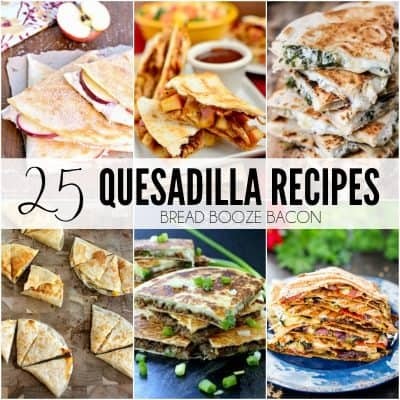 It’s a guaranteed hit for your next get together! 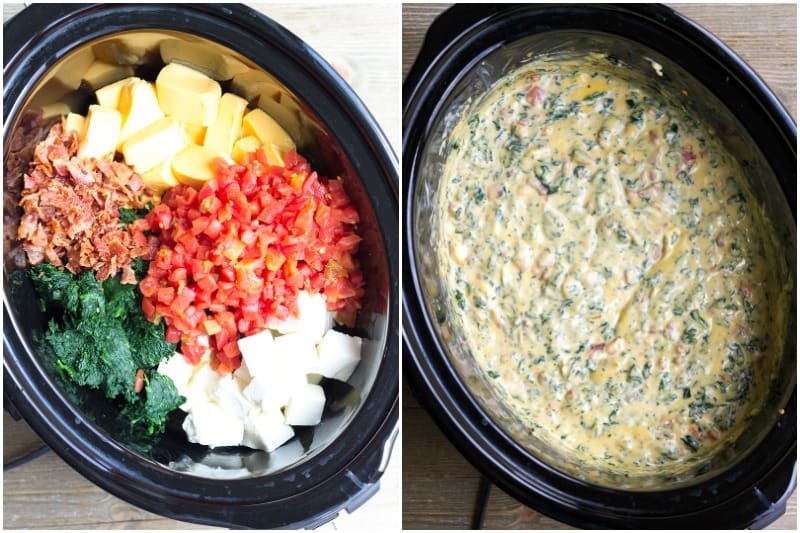 You'll never need another cheese dip recipe again after you try one bite of Crock Pot Spinach & Bacon Queso Dip! Place all the ingredients in a 1.5-quart slow cooker. Cover. Remove lid, and stir until all ingredients are well combined. Turn slow cooker to WARM. Cover and keep warm until ready to serve. We like our dip with tortilla chips! You can easily double this recipe and prepare it in a 5-quart slow cooker if you're serving a crowd. The dip will cook on HIGH for the same amount of time. Sooo refreshing idea to use vegetables in a dip. Keeper definitely ! Thank you so much ! 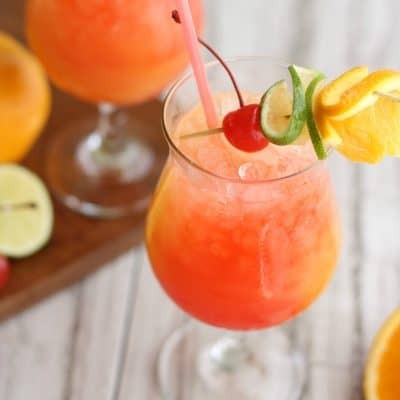 omg…what a recipe…..This looks really really yummy.. I like these kind of dips..so thank you so much for sharing this here..
Hello and thank you for this I wonder if fresh raw spinach can be used instead of the frozen kind? Hi Gina! I think you can get away with raw spinach you just need to rinse it REALLY well and remove the stems. I’m not quite sure how much you’d need to equal the same about of frozen (wilted) spinach though. Do you stir the ingredients together at the beginning or just at the end? They don’t have diced tomatoes with chillies here in Nova Scotia. I am using diced tomatoes with chilli seasonings. Should I use something else to give it more spice do you think? This recipe is from the inside of the Velveeta packaging. That said, I won the dip competition at work making this.